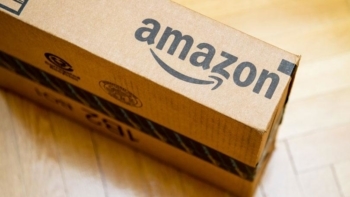 Get 50% (up to £50) off your next Amazon order! UPDATE Feb 2018: This offer has been extended to 14th May 2019 as you will see if you click the ‘Terms & Conditions’ link below. You are still OK to sign up and get your £50 Amazon voucher! This is your last chance to take advantage of our ‘free £50 to spend on anything you want at Amazon’ offer! Back in October and December we ran a very generous promotion with Amazon Business. Until Tuesday night, it is back. 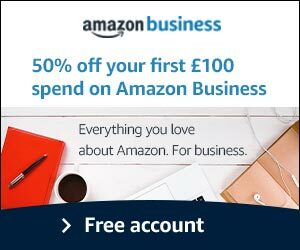 If you sign up, for FREE, to Amazon Business you can save £50 on your next £100 Amazon purchase. For clarity, the £50 discount does NOT have to be used at Amazon Business for business products. You can spent it on anything on the main Amazon UK site which is ‘sold and despatched’ by Amazon. If you have your own business and sign it up – for FREE – to Amazon Business before midnight on Tuesday 12th February, you will be emailed a promo code for 50% off your next purchase, up to a maximum £50 off. Virtually all items on the Amazon UK website which are sold directly by Amazon, not from third party sellers, are included. You need to redeem the voucher by 17th February. To sign up to Amazon Business you need to click here or click the ad above. You will not see any reference to this offer on the landing page. Don’t panic! It really does exist, honestly. If you click here you will see the Terms & Conditions. Only a few Amazon partner sites are being allowed to promote this deal which is why it is not on the landing page. All Amazon Business sign-ups using our link will receive their 50% discount code by email once Amazon Business has verified their account. You MUST click through to Amazon Business via our link (the URL will say shopperpoints-21 at the end) to receive your 50% discount code. If you have extra-strong anti-tracking software on your computer, it may strip out the tracking code from the URL. This means that Amazon will not see that your click came from us and you won’t get the voucher. If you have installed additional ‘no tracking’ software then, before completing the form, double-check the URL in your browser does still show shopperpoints-21 at the end. The code should arrive roughly 48-72 hours after you receive your welcome email from Amazon Business. When we ran this offer in October, some readers had problems receiving their voucher. Initially this was due to an IT problem with Amazon which was fixed. However, some readers still had problems due to GDPR data protection issues. If you tick the box during the sign-up process to say “do not send me marketing emails from Amazon”, then you won’t be receiving your £50 voucher. This is because Amazon cannot email it to you! DO NOT OPT-OUT OF MARKETING EMAILS! I’m pleased to say that there were virtually no problems when the offer ran for the 2nd time in December. You can find out more on the registration page here. Add GB in front of your VAT number if requested in order for it to be accepted. Remember that you won’t see any details of the 50% discount code there, but sign up with your company details and it will arrive around 48-72 hours after you receive your initial welcome email. The full terms and conditions are here. The deadline for signing up to Amazon Business to get a 50% discount code is Tuesday 12th February. You will have until 17th February to use your discount code. And remember – DO NOT OPT-OUT OF MARKETING EMAILS! No comments – I guess all of us with opportunity to open a business account took up the offer long ago. Still it was an easy £50 . . . Anyone know if it is churnable?? If you own a 2nd business it might be possible. I applied for a business account through this offer, before the end date, and received my voucher code today. However the code will not work and on chatting with Amazon their terms and conditions state that the code is only valid for accounts “verified” before Tuesday and my account was only verified today. This seems a little unfair as there is no mention of this in the article above, unless I missed it. This may not be true. The call centre tends to make things up as it goes along. If Amazon has sent you the voucher then logically it should be OK.
Are you definitely trying it on something ‘sold and despatched’ by Amazon? Hi Rob, Amazon are quite frustrating to deal with at the best of times. The item I am trying to purchase does state the following: “Dispatched, sold, and invoiced by Amazon” I would assume this would meet the criteria? Voucher can’t be used on anything which is invoiced. Must be paid at time of order. I am buying direct from Amazon and paying with a credit card but the voucher is not working. If Amazon sent you the voucher then that surely implies it is fine to use. Why should you be penalised by the time taken to validate the account? Ok, so I tried the code again this morning on the book and it worked…. Removed the book from the basket and added my original item and the discount was applied. So all good now, maybe just took a day or 2 for the voucher to activate. All sorted now, thanks for your help and time. Hi Rob, you say the voucher needs to be used by the 17th Feb, but on the Amazon T&C’s it says valid until 18th May. Any idea which is the correct date? If that’s what it now says, they have rolled over the offer. HOWEVER …. when the roll it over they cancel all existing vouchers. Only vouchers issued in the new promo period listed in the rules will be valid until May.